Published on January 20, 2013 by Apol Danganan Follow me on Twitter here. They gagged, they choked, they puked. Many foreigners, businessmen and travelers alike have defied squeamishness and bravely tried to eat balut, only to fail and prove themselves not as adventurous as they thought themselves to be. Many foreigners have failed to conquer this notorious delicacy of the Philippines in their attempt to immerse themselves deeper into Filipino culture. I can’t blame non-Filipinos if they throw up once they feel the crunchy beak and the hair of the tiny, pitiful dead duckling in their mouth. Made even more notorious by Fear Factor, visitors to the Philippines are curious about how revolting this infamous food really tastes. Balut is a fertilized duck embryo that is boiled after a number of days of incubation and traditionally sold on the streets at night. Some vendors walk or bike around as they peddle this delicacy; while others stay at a fixed location. 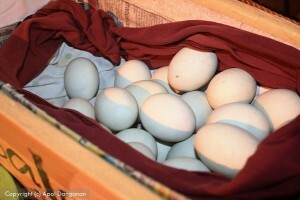 The balut themselves are kept in a bucket or wicker baskets covered with newspaper and cloth to keep the eggs warm. 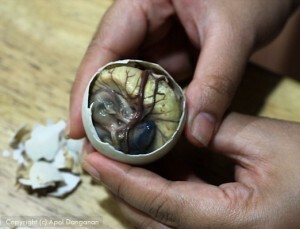 Balut doesn’t only look gross but also tastes disgusting to those who are not conventionally eaters of this food. Even some Filipinos do not eat it. But I’ve like balut ever since I was a kid. 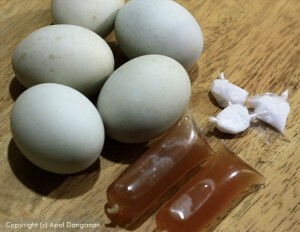 I can still vividly remember the balut vendor who went to our house to deliver them to my grandfather every night. My mom told me I would eat up to five of them each evening!! Unbelievable. Now, scared of hypertension, I can only gobble up to three. I prefer them hot, with broth, more tender yolk, and a less developed fetus with spicy vinegar. I like to feel it just melt in my mouth after eating it whole, not bit by bit. I bought 5 tonight and ate three of them for dinner. Balut can be taken home or eaten at the vendor stall. I ate one where we bought them so I could have a little chat with the vendor and took the rest home. Salt and spicy vinegar are usually ready along with a container where the shell can be thrown into. I was fortunate that the balut vendor was friendly. I threw some questions to him while eating and he willingly answered. I didn’t even have to tell him to pose for the camera, he just did it. “How many days do these eggs get incubated before they could be boiled and sold?” I asked. “17 days. They are put in a box covered with newspaper to retain warmth. More than 17 days, they’ll be ready to hatch,” he answered. 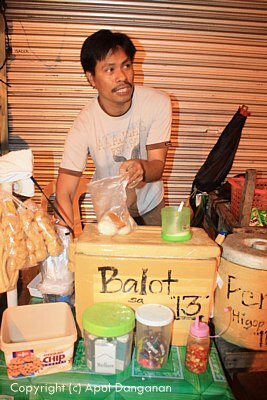 His name is Gilbert and he gets his daily supply of eggs in Pateros, the town famous for producing balut. He sells across the wet market from 7pm until 2:30am. With ₱1,500 as capital, he could earn from ₱300 to ₱600 each night. The earliest he could go home is 11:00 pm. 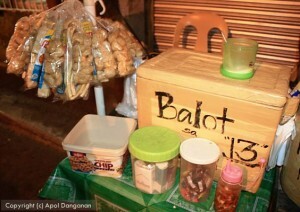 He sells balut at ₱13 and penoy at ₱11. He sells chicharon (fried pork skin) too, some cracklings, cigarettes, and candy. “How many eggs do you get from Pateros everyday?” I inquired further. “120 Balut and 50 Penoy eggs. They are sold out every night. There is another location where he sells 50 of the balut eggs.” He replied pointing to his companion selling balut in another location close to the market. I asked if I could take photos of what the inside of the buckets look like and he removed the lid for me. 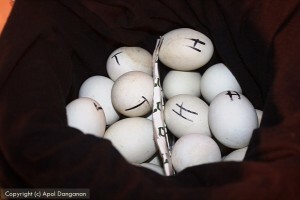 “What do the letters mean in the Penoy eggs?” I asked upon seeing the letters T & H on the eggs. 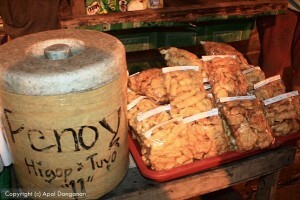 Penoy is sold side by side with balut. It is just boiled duck egg, no duckling inside. Gilbert said T means tuyo (dry in Filipino) and H means higop (sip) indicating there’s broth inside. They can determine whether the eggs have broth or not if they hold the eggs to a light. 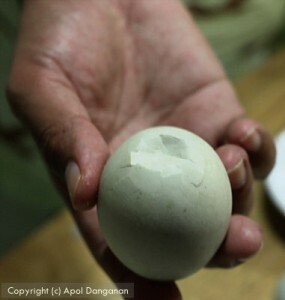 Balut is said to be a great source of protein and an aphrodisiac. Men would eat it along with beer during drinking sessions. Some eat it with rice. But times are changing. 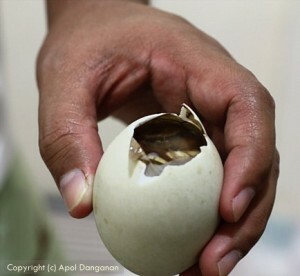 The humble balut has evolved and can now be cooked adobo (a Filipino style of cooking using soy sauce and vinegar) or omelette style. It is now served even in restaurants and not only sold at night on the streets. There are now food stalls in the malls that sell them throughout the day. They are already even sold in 7-Eleven stores and are kept warm by steam. Look for the flat part of the egg and crack the shell by a spoon or tap it onto a solid surface. Remove the cracked shell to make a small hole. Be careful not to spill the broth. Sip the broth. Add vinegar first if you want to add flavor then peel off the shell to reveal the inside. Sprinkle with a pinch of salt or add vinegar. You can devour the whole thing or eat it bit by bit. Eating it whole is less gross because you’ll not feel the duckling in your mouth so much as you chew it with the yolk and you’ll not see what’s left of the duckling as you would if you eat it bit by bit. The white can be left uneaten. That’s it. 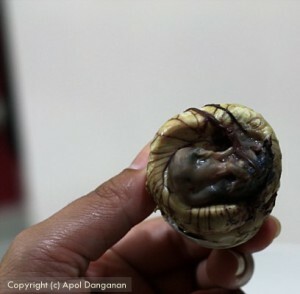 Balut may look gross but it is delish for many. If I don’t stop myself, I can eat more than three. Though few recipes have been made from balut, many people — including me — still prefer to eat it the traditional way: boiled. Will you ever try this when you come here in the Philippines? I dare you. Just be sure to focus on the taste, not on the terror of eating the balut. yuhum_yuhum I can’t say that it looks particularly appetizing — especially the beak and hair — but I’d be willing to give it a shot. I have to say that I’m impressed that you can eat five of these in a row. Maybe I will have to challenge you to a Balut eating contest! 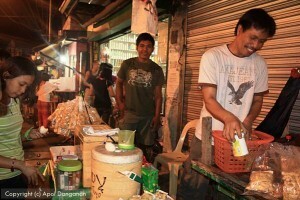 @vagabondjourney though I like balut, I don’t like looking at that 1st picture in the post..haha. Balut does look gross even to me..but only in photos. I think I can still eat 5 but it could be cloying esp. w/o vinegar. When the duckling is really tiny, u wont feel the hair..there are balut eggs that could really just melt in the mouth, esp. newly boiled ones. There are some too that are dry with bigger duckling and needs more chewing. @yuhum_yuhum @vagabondjourney Looking forward to trying them! @Vagabond Journey I myself will buy them for you hehehe! So this is considered a local food in Philippines? Something interesting to know but I am definitely not daring to try since it looks like a human’s embryo. Wow. That is an eye opener. I’ve always heard so much about this beloved Pinoy snack. Thanks for giving us an up close peek (literally) into what is going in the egg and how to go around eating it!